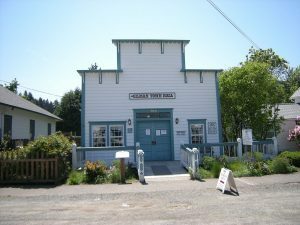 Issaquah’s origianl Town Hall dates back to the period when the town was called Gilman (1892-1899). The Gilman Town Hall was constructed in 1888 as a community hall. The Town of Gilman purchased the building in 1898 for use as the Town Hall. In addition to providing a place for governance, the building served, at varying times, as a polling place, library, school, police station, and fire department. In its early years, it is said, young men of the town held wrestling matches here. Issaquah’s Town Hall was retired in 1930, when a new Town Hall was constructed. 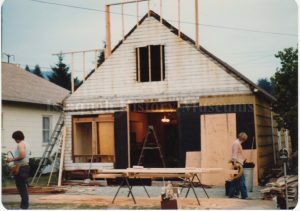 The building was a home to several families between 1930 and 1972, when the City designated its use to the Issaquah Historical Society. Volunteers worked to restore the building’s historic false front facade. Today, the Gilman Town Hall is one of the Issaquah History Museums, and the location of the organization’s main offices. This exhibit tells the story of Issaquah’s past through hundreds of photographs and artifacts and a variety of interactive elements. Come see one of Issaquah’s original water pipes, a rare Native American fur trade knife, and graffiti hidden for 75 years inside the walls of the fish hatchery. Set off an imaginary charge with an authentic dynamite blaster, ring a logging camp bell, listen to the music of the Squak Valley Hot Shots — and much more! The kitchen contains a wealth of small objects that remind us of the dawn-to-dusk work of the pioneer homemaker. These include an old wash tub and scrub board, kitchen stove, and water pump. A children’s touch table gives visitors the opportunity to pick up an old sad iron, handle a butter bowl and paddle, try on hob-nailed boots, or examine an old-fashioned curling iron. From the museum’s back door you can go directly to jail – the old two-cell town jail, which was constructed in 1914 of solid eight inch concrete walls and still has the original iron bars in the windows. The forged iron lock bar weighs at least 80 pounds, and effectively cut the escape count to zero. Gilman Town Hall, 1940. Photo courtesy of the Washington State Archives. Gilman Town Hall, during its time as a residence. (IHM FIC-2001-9). Follow us on social media and help us share past, present and future of history with the world.